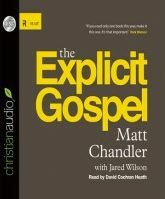 In The Explicit Gospel, Matt Chandler and Jared Wilson explain what the gospel is and why it is important that it is made clear. One of the things I most appreciated about the book was the emphasis on the importance of deliberately making sure the message of the gospel is clearly proclaimed to both non-Christians and Christians. I’ve so often seen it inaccurately assumed that Christians and even non-Christians grasp the message of the gospel which can have some really unhealthy consequences. Another main strength of the book was that it emphasised both the work of Jesus in an individual’s life and the work of Jesus redeeming all of creation. There is often an unfortunate tendency to overemphasise one at the expense of the other that this book avoids. This book is clear that both are necessary and complement each other. However, while certainly it is worth being cautious about over-simplifying the gospel, I felt the book sometimes went too far in the other direction. Some points seemed to drag on due to having more explanation than necessary. He also sometimes wandered a bit off topic into things like why limitations of the scientific method make it difficult to conclude with certainty about issues such as the origin of the world or gender roles. He made some very good points that would be worthy of discussion elsewhere but weren’t particularly necessary in the context of the broader argument of the book. I suspect that younger or confused Christians who are most in need of a sound explanation of the gospel might get bogged down in the excess detail and loose sight of the important points. I “read” this book in audiobook format. The narration was clear and animated enough to not be monotonous. However, if I read the book again, I would probably use a print copy to allow for easier note taking and scripture reference checking. Overall, although the book might have benefited from being a little more concise, it still has a lot of good things to say and is worth the time to read.